There is an old sales technique from the 1970s that works very well on the Internet. I know because I’m an old salesman from the 1970s! 🙂 It’s called building “yes momentum” and it works incredibly well to raise conversions on sales letters, one time offer pages and squeeze pages too. I want to share with you how it works and how you can begin using it today. But first, let me ask you three questions. If there was a marketing strategy that you believed with all your heart would work for you would you spend one hour to put it into practice? Not one hour a day – one hour ever. If you could increase sales with your current level of traffic would that have an impact on your bottom line? Do you want to sell more products with less effort starting today? If you answered yes to all three of these questions (or any of them!) then you just experienced what “yes momentum” is all about. The idea is simple but highly effective. The premise is this – if you can get your prospect (be they a visitor to your site or a reader of your ad or article) to say “yes” in their head enough times then when the time comes for them to decide to buy or not buy the momentum of the “yeses” will carry them through and more of them will buy. This method works. I use it all the time and in almost all of my marketing. The wonderful thing about it is that you can increase sales without needing more traffic. While many believe that more traffic will increases sales the fact is that many people are getting the traffic they need now but not converting that traffic into sales. I’m all for getting more traffic but I’m just as interested in converting as many visitors into customers as possible. This technique will help do that. Let’s look at where you can use it and I will share a bit from my experience about how to use it too. This technique works very well in these marketing locations. If you know squeeze pages then you know they need to be short and to the point. One technique that works well is to use only questions on your squeeze page. The secret sauce here is to ask questions you know the prospect will answer with a “yes”. When you do that you build “yes momentum” and more people will opt in than ever before. 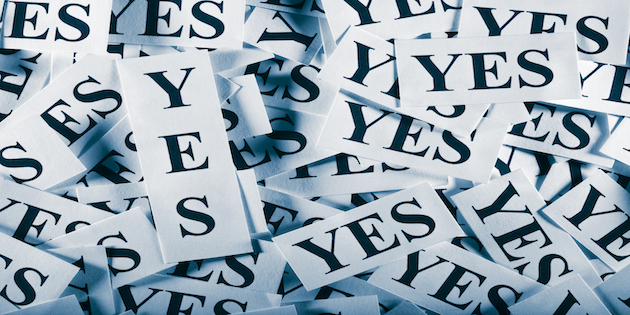 When it comes to sales letters you need to choose where you put the “yes momentum” section. The best place I’ve found to use it on a sales letter is in the recap section – the area where you are recapping what they get. This usually comes after the price justification section where you show them why your product is worth the money you are asking. Then you follow that with your “yes momentum” questions. Remember to make these questions that most people will quickly answer with a yes. I don’t like OTO pages but I do see the value of them when it comes to up-selling, so I will cover them here in case you use them. If you are going to use “yes momentum” on a OTO page the best way to do it is to tie the questions into the product they just bought and less into the one time offer. Here’s an example. Let’s say you just sold a book for $20 and now have a one time offer of $197 for the video series from the book material. That’s a common, and effective, use of a OTO. Want to put what you learn into practice immediately? Would it help to see what I’m teaching in practice rather than just reading? Want to look over my shoulder as I do what I teach? These questions aren’t perfect because I’m talking about a generic product but you get the point. I would use the “yes momentum” questions as a lead in to the one time offer and not in the conclusion. Thank you pages are the most valuable real estate online. You can keep your Twitter followers and Facebook fan pages. Put me on your thank you page and I’ll make sales all day long. Why? Because when your new customer lands on that thank you page they are at the happiest and most optimistic point possible. They just purchased a product they believe in enough to pay for and are ready to get started. You know the feeling. The world is chock full of possibilities and you can’t wait to get going! It’s call enthusiasm and it is a powerful selling force. So why not capture that enthusiasm and ask them three simple questions and get them to take the next action as well? NOTE: I’m not talking about a one time offer page here, I’m talking about a traditional thank you or download page. The key here is to determine the most valuable action you want them to take. In my view, the most valuable action to ask your new customer to take is to refer you to others. Because their enthusiasm is high they will be happy to share with their friends. First, you need a set of “yes momentum” questions. This should be simple since they just bought from you. Second, you need a “tell a friend” form for them to fill out. I use and like a product called Instant Form Pro. Third, you need to decide if you want to go for the pure recommendation or create an incentive for them to share your sales page. I don’t like to incentivize here personally because it leads to junk email addresses entered for the sake of getting the prize. I do like, and use, the straight-out asking for the referral technique. And it works very well. In today’s world of spam filters and short attention spans, shorter emails work better than 1000 word articles. This is why “yes momentum” questions work so well in selling emails. Here’s an example. Let’s say you are selling a business opportunity that empowers people to work from home selling products as an affiliate. Three “yes momentum” questions might be. Want to work from home but not sure how to start? Do you need to create a powerful income fast? Tired of the hype and high pressure and just want to facts about making money online? Again, these are not perfect questions because I’m writing about a generic product, so I can’t get super specific. But you see the point. Solo ads are emails sent to the entire list of an ezine publisher (or other list owner) for a fee. Your email goes to the list and only your email, hence the name “solo”. Since solo ads are actually selling emails the advice above applies so try that in your next solo ad and track results. I believe you will like what you see. To use “yes momentum” with classified ads make the entire ad a series of short “yes momentum” questions. Here’s an example using the copy above. I’m sure you know Twitter but are you making any real money on Twitter? The only way to make sales using Twitter is to get the click. The best way to get the click? You guessed it … building “yes momentum”! Because you are so limited on Twitter I recommend using only one question per tweet. This works very well for me and I hope it works equally well for you. In fact, I have found this to be the second most effective way to get clicks on my Twitter account. How can you put this into action in your own business? Here are three ideas. Third – Test the idea to see how it works for you. The idea of “yes momentum” works incredibly well when used strategically. I hope this article helps you see how to do that and that using “yes momentum” helps you sell more than ever before. Because more sales – especially when what you sell helps real people – is a beautiful thing indeed! How Many Sites Do I Need? Great article, Charlie. Lots of examples in a lot of different platforms. The 3 action steps are common sense and doable. Very cool article. I gotta ask: If “Yes momentum questions” are your 2nd most most effective click-getting technique on Twitter, what is your top one? Inquiring minds want to know…at least one :-). Good question. Not too many noticed the “second” part. My #1 click getting technique across all mediums is to share actionable information openly and without thumping any product, including my own. I will often tease in a tweet (because they are short) but never send anyone to a sales page, only to a content page. Sales happen after that based on my automated systems and only IF the person self-selects that they need the product, not because I’ve pressured them. Great question as usual! Thanks. I’m loving the articles, it’s like you made them just for me lol. But I am taking your advice and applying them into my work. Excellent article as always. I’m heading Into the email marketing world. Its hard to build a targeted list, but I have been learning some techniques here and there that seem to make life easier to get those targeted emails from potential customers. Let’s see If they work. My mental strategy Is always to work, test new things and Always Take Action. Sometimes I fall victim of not wanting to do some projects anymore because of failure, but one can use that same failure to give you more drive to test others things to find the great success. Great stuff as usual Charlie, thank you very much for the best info about just about anything to do with online business. That’s an outstanding article! You just put me back on place where I had begun to take things as granted. The three most powerful words a marketer need to learn how to use. Charlie, you frame it perfect here. Wouldn’t we all gain from applying this in what we do? Will you that read this apply, starting today? Tweeted for you and will be sharing in my newsletter. First, How is your” brother ” I trust he is holding his own, You keep strong for him and he will produce his inner strength. Many thanks once more for some more words of wisdom. I have made notes of them and will put them to the test to the best of my ability. Always delighted your articles. This is another of your words of wisdom which I will treasure for good. I hope to use them in my prospecting. Charlie, Thank you for sharing your knowledge freely with every one without a cost. Thank Charlie Again as I am going to make more monewy with this information! Charlie, This has to be one of your best articles you have ever written. It is something that everyone should know, but forgets all about when creating their websites, sales pages, squeeze pages, etc. I think they become so engrossed in selling to people that they forget such a basic concept – and it works so well. Thank you for reminding me of everything I should be doing in my sales page creation. Great information on improving marketing results. Thank you. Once again Charlie great stuff! as simple as having a piece of sweet cake. Thanks as usual for the great post. Thank you Charlie, I will implement it on my next post on Twitter and Facebook. I have leaned much from your good information articles. Just read your Artical and find it verry informing and I love your Ideas. You make this internet marketing stuff looks like “easy” and I really think it’s not. Thank you for these new terms I’ve just learned about the “yes momentum” you’ve posted this occasion. Thank you Charlie! Very good information about building “yes momentum”. I am going to implement it on my sales pages. Thanks Charlie. This info is perfect for a planning session I have on Tuesday – its almost like you wrote it for that meeting. Thanks again – you are very much appreciated. Thank you Charlie. This is an excellent article. I love reading things that are an in depth analysis of a technique with examples of how the technique works. This was enlightening to me. Thanks! Very good information, thanks Charlie. I shall be using this on my sales pages and also be watching for it when people are trying to sell me something! I enjoy reading your articles Charlie because I learn so much from your expertise. I haven’t heard of the “yes momentum” before, it makes perfect sense. Thank you for sharing it. Great article. Very good post and if anybody has been truly in sales this is stuff that they should know, or least the reminding them of it should jell the dust cells in their brains. One of my first jobs in life was selling china and silverware, door to door. I don’t think anyone doess that anymore, but it was the best sales training ever. We had a presentation book and on each page of the presentation, there was a question to which the prospect couldn’t possibly say “no”. On page that I recall pictured a lady with a bright red dress. It was my time to say “isn’t that a red dress?”, lol. It really worked, though. Of course it always is number one to sell something of value. Thank You for this great information. The information in your emails is so valuable to me that I never delete any of of them and will often look through them to see if you have already answered a question I was not ready to ask at the time. Thanks. I’ll be implementing your squeeze page suggestions today. OMG! I learned about this way back when in my MLM days. Now I know why it works and how to apply it in more ways! : ) Thanks buddy! of store I never go back before the owner buy from me and now you said Charlie about yes momentum , you make the buyer or your follower say yes ha..ha..ha good idea Charlie . I’m not familiar with that product but the concept of yes momentum actually comes from in-person selling more than from the Internet. I just adapted what I learned offline for the web. If you liked this idea you might take a look at some books by Tom Hopkins for more selling techniques. Hey Charlie. Another very simple and powerful way to increase your results online. Thanks for laying this out so simply. I am going to put this to immediate use and I know that I will be happy with the results. Keep cranking out the great advice. I always open and read your stuff because it gives me real useable data – and not a bunch of pie in the sky hype I seem to get from most other places. Your the best. As always, you generously share very useful information. The content is to the point, easy to understand and to implement. So when you suggested a WSO for the first time, I went and got it. I’m very conservative when it comes to purchasing affiliate marketing offers. I said to myself “Charlie recommended it, so it must be good!” I wasn’t disappointed. Very nice, Charlie. I found myself thinking how practical this was and how “naturally” smart it was too. Then it hit me that when you get the customer/prospect saying “yes,” the underlying psychology is that he/she is thinking you’re smart! Right on Charlie, I have spent over 50 years in sales and marketing off line and I’ve used the “yes momentum” technique over and over. Now that I am trying to “break the code” into internet marketing you have showed me how to use in here too. Thank you! Thank you! As another “an old salesman from the 1970s!”, I can vouch for Charlie’s accuracy regarding the “Yes Momentum” technique is spot on. Thanks Charlie for sharing this and reminding another old veteran salesman about this. It’s a winner! Thank you once again for sharing this great tips. This “yes momentum” article really gave me something to think of,yes! Thanks Charlie for another good article! Not only do I thank you, but I’ll also recommend this information in my next newsletter. Anyway, I find great value in all your articles…thanks. Good question. My #1 technique is to share high quality original content and provide a link to learn more. Thank you for your comment. Thank you for this great article. I will certainly use your ideas in my marketing business. I’ll be in touch, one of these days, to buy some solo ads from you. the momentum method for sure.